Edition Statement 2nd None ed. "This fascinating insight into the origin of roads will break down some road ownership issues, and help promote harmony for all road users whether on four wheels or two." - Edmund King, President, Automobile Association. "...closely argued, meticulously researched [this] book is also a treasure trove of curious trivia and arcane detail. 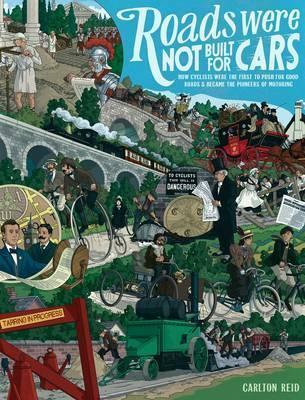 [The] iPad edition puts [publishing] professionals to shame, featuring lovely use of video, a wealth of images, clever 30 models, and even a 19th-century ditty about speeding cyclists." - The Guardian. Carlton Reid's work has appeared in National Geographic Traveller and The Guardian and many other magazines and newspapers. He is the executive editor of BikeBiz.com, a monthly trade magazine which he founded. His previous books include Adventure Mountain Biking (Crowood Press, 1990); Complete Book of Cycling (contributor, Hamlyn-1997); l-Spy Bicycles (Michelin 1998); Discover Israel (Berlitz 1998); Lebanon: A Travel Guide (Kindlife 1995); Classic Mountain Bike Routes of the World (contributor, Quarto Publishing, 2000) and Bike to Work Book (November 2008). He was co-manager of the first ever British mountain bike team. This team competed in the World Championships in Villard de Lans, France, in 1987. In June 2008, he was inducted into the MBUK Mountain Bike Hall of Fame, one of the first 20 inductees.